Since the beginning of the Syrian Revolution, Aleppo rebels have relentlessly documented events on the ground through their media outlet halabnews.com, providing footage for top international broadcasters. This documentary film approaches the media arm of the Syrian resistance where war photographer Enea Discepoli, who attempted to organize a photo exhibition in Old Aleppo with media activists from Halab News media, left off. Crossing the border, photographs in-hand, they would soon find that conditions on the ground made their exhibition impossible. This story similarly aims to see through the lenses of these young Syrian media activists, to witness the Syrian tragedy unfolding since 2011. Told through interviews, facts given by reporters, and through filmed first-hand accounts of the tragedies unfolding on the ground; the film seeks to put the viewer directly beside these Young Syrian Lenses. 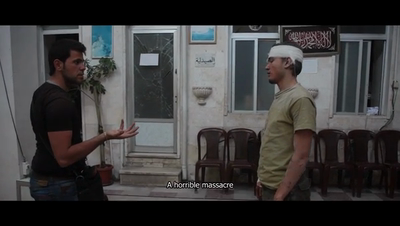 Military operations unfold on camera, however, the film also engages the Aleppo Local Council which is the only democratic hope for the population. This journey alongside a group of young, hopefully media activists is told through images rather than narration. At the same time, the film prefers considering the human condition instead of high-impact military imagery that too often let the viewer forget the humanitarian tragedy of war.